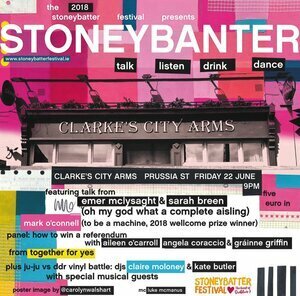 Posted in Misc and tagged Stoneybatter Festival at 11:21 am on June 20, 2018 by Bodger. They’re getting great mileage/acreage out of it fair play to them. Awful cringey stuff though, building on Irish stereotypes. Country women must be livid. Most of the country women I know quite like it. Oh my god I’m completely wrong then! Let them ‘memmy’ away so. I’d go only my bike’d get nicked. Hey, that crossbar feels fun…waaaaaaaaaaait a minute! Good Lord! I thought Mary O’Rourke was bold! Ah will you F offa….! Looks rubbish. Also, I’m far to old for this kind of stuff. Jaysus have a look there at the gender balance over on the broadsheet contributors. Authors. Indeed. Nevermind the cesspit of commenters. Would you have a good chance of finding a love partner though? I’ll turn up if there’s a discussion on G-entrification. 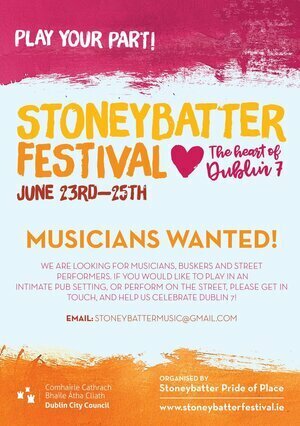 D7 is now Dublin’s Kreuzberg. Portobello is gone for good. Looks like a good line up. 80% includes trans, non-binary, I presume. Hope.